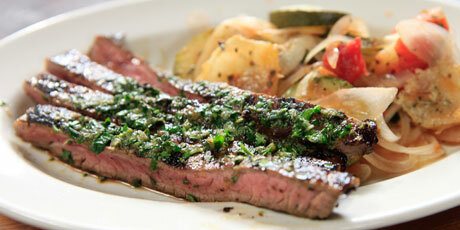 Marinated flank steak grilled or broiled to perfect and served up alongside slow-baked zucchini tomatoes and potatoes. 1. For the marinade: Combine the olive oil, rosemary, Worcestershire, mustard, vinegar, black pepper, espelette, cinnamon, garlic, espresso and shallots in shallow dish or large plastic food storage bag. Turn the steak in the marinade and refrigerate for a few hours or overnight. 2. Heat the broiler or grill pan over medium-high heat. Cook the flank steak about 12 minutes, turning once. Let the steak rest 5 to 10 minutes, then slice across the grain into 1/2-inch-thick slices. Dress with lemon juice, parsley and sprinkle with a little salt to finish. 1. For the zucchini and potatoes: Preheat the oven to 375ºF. Pour half of the tomatoes into a casserole dish and break them up a bit. Sprinkle some thyme over them and drizzle with olive oil. Top with a layer of zucchini and season with salt and pepper. Top with the potatoes and season with salt and pepper, some rosemary, sprinkle of garlic, some onions, a drizzle of olive oil and some grated cheese. Repeat the layers until you use up all of the vegetables, and bake until bubbly and brown and the potatoes are tender, about 1 hour 30 minutes.